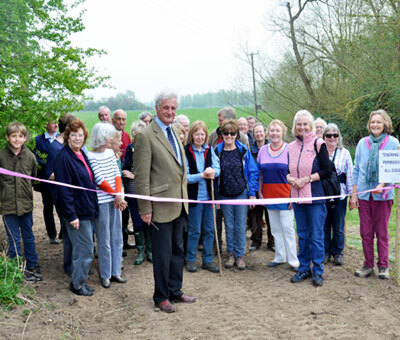 The new permissive footpath linking Nayland to Stoke by Nayland was officially opened on 3rd April 2014. Villagers from both parishes gathered to watch as Hector Wykes-Sneyd, land agent for the Tendring Hall Estate, cut the tape. In 2012, the Trustees of the Tendring Hall Estate approved in principle the creation of a permissive footpath by way of an extension to the existing Permissive Footpath which runs alongside the B1087. The Conservation Society agreed to partly fund the £2,000 estimated cost of the work with the aid of a grant from the Dedham Vale AONB and Stour Valley Project Sustainable Development Fund. We are extremely grateful to the Tendring Hall Estate for enabling this project to go ahead, which will link the villages of Stoke by Nayland and Nayland by a direct and safe walking route and which we hope will be used by local walkers and visitors for many years to come. We were delighted to welcome Carenza Lewis back to Nayland on 23rd June to hear about the detailed results from the 16 Test Pits which were dug in September 2014. The total number of pits so far dug in Nayland is now 50. Click to view the full resume of the meeting. In summing up Carenza emphasised that seemingly insignificant sherds of pottery can reveal extraordinary results because 90% of it is easily datable. The legacy from the first Test Pit Dig in October 2012 stirred up so much interest that a Follow-Up was organised and there is definitely a potential for more test pits to be dug in future especially in the centre of the village, around the church and Carenza considers there is now enough expertise within the village for us to undertake this ourselves without the need for expensive experts. 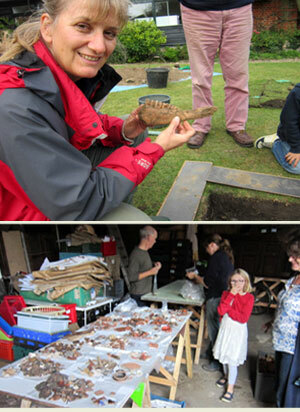 Thirty four test pits were dug in Nayland over the three days from 5th to 7th October 2012. The briefing sessions by Carenza Lewis were very well supported with about 70 people attending each one on the Friday and Saturday. Residents, friends and visitors of all ages worked together and there was a feeling of excitement throughout the village. Balloons and some notices inviting people to come and see what was happening, encouraged casual visitors to view the work. Several interesting finds were uncovered including some fragments of Roman pottery, and worked flints, 2 Elizabethan coins, medieval pottery, tiles and a lot of Victorian artifacts and glass bottles. A Public Meeting with Dr Carenza Lewis was held on 29th April 2013. Based on our spot identification of those incoming finds we had a chance to look at (which in many cases won't include those made later on Sunday, which were handed in a the last moment). The evidence clearly suggests that in the prehistoric period people were living at the western end of the present village, where Test Pit 1 (105 Bear Street) found very fresh-looking flint flakes from tool-making, probably in the Neolithic period. So this area may have been the first permanent settlement at what is now Nayland. There's no evidence for any settlement continuing after that for a very long time, until about 1200, when the village appears to be founded. A lot of pottery dating to 1200-mid 14th century was found, especially in pits along Bear Street and around the church at Alston Court . It's quite unexpected that the village doesn't appear to have its roots in the late Anglo-Saxon period, most of our villages do originate with settlement in this period, although it's less common in South Suffolk and Essex. Newlands Lane and Fen Street may have been slightly later extensions to the settlement. 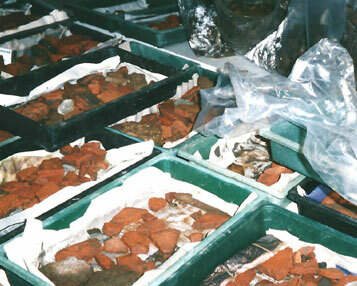 What's really remarkable is the amount of later medieval pottery found - although we'll need to wait for the final assessment, at the moment it looks as if Nayland is a member of the minority of settlements which didn't see some severe contraction in the post-Black Death era - in this it is similar to Long Melford, but very different to Clare. We are extremely grateful to Managing a Masterpiece and the National Heritage Lottery for funding and arranging the dig. We were delighted to announce that at a Christie's auction of Old Master Drawings in London on Tuesday 3rd July 2012, the Conservation Society purchased an original sketch by John Constable. The subject is a pencil drawing showing the reredos (decorated stone screen) at St. James Church, Nayland indicating how the proposed altarpiece might look in situ. 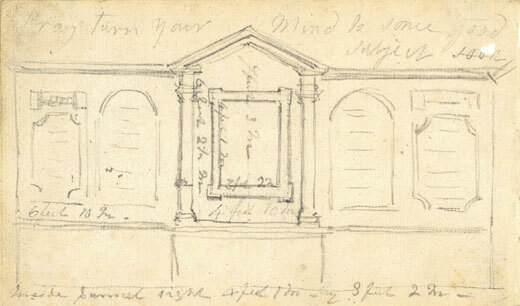 The pencil drawing is thought to have been executed during Constable’s 1809 autumn visit to his aunt, Martha (Patty) Smith, who lived at Longwood House, Nayland . The original size is 3 ¾ x 6 ½ in. (9.5 x 16.5 cm.). The witty inscription is a reference to the difficulty Constable encountered in deciding on a subject matter for the painting in the centre of the reredos (a decorative stone screen behind the altar). Constable’s uncle, David Pike Watts, wrote to Constable in January 1810 criticising the original choice of The Resurrection. Constable’s next plan was to paint The Agony in the Garden, for which there is a sketch in the Louvre sketchbook. By mid July, after further advice from Mr. Watts and his family, the subject changed again and Constable settled on the Christ Blessing the Elements of Bread and Wine at the Last Supper. 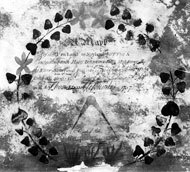 Village records show that in 1767 £35.18.3 was paid out in Nayland Charity money for half the cost of a new reredos which consisted of 4 panels of black stone – probably marble – on which were inscribed The Commandments, with a painting of Moses in the centre. In 1810 Constable’s painting was placed in an oak frame within this reredos, which was replaced by the present Caen stone screen in about 1869. At the time, the picture was removed, but the parishioners demanded its restoration and it has been there ever since. The hammer price was £1,200, added to which is Christie's commission of 25% plus VAT on the commission, making a total of £1,560 which will be met from Society Funds. An enlarged framed copy of the sketch is now hanging in St. James Church, together with a 'paddleboard' describing the background to the sketch. The original work has been framed and will be kept in a secure place. It will displayed at the Society’s open meetings. In the same way that the David May photo collection we purchased has proved so worthwhile, we know the same will apply to our very own ‘Constable’! We are delighted that we were successful in bringing this unique work back to Nayland. Following negotiations between Babergh District Council, BT and our district councillor, Richard Cave, it was decided to re-instate the Wiston telephone kiosk on the Bear Street site. 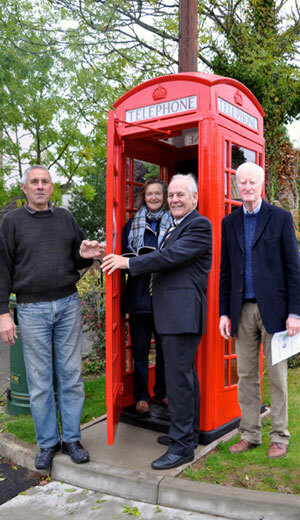 The Parish Council felt the cost to the ratepayers was too heavy so invited the Conservation Society to adopt the box. The proposal was approved and we were very excited that the Society was able to step in and save this iconic symbol of what is becoming a by-gone era. The Society formally adopted the Kiosk and it has now been refurished and again takes its place as a landmark in Bear Street. 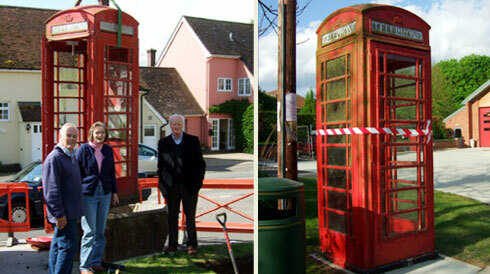 A sign inside the box will read: This K6 BT Kiosk was removed from Wiston and adopted by the Nayland with Wissington Conservation Society who have funded its refurbishment. Babergh District Council made a contribution towards the cost of its removal. 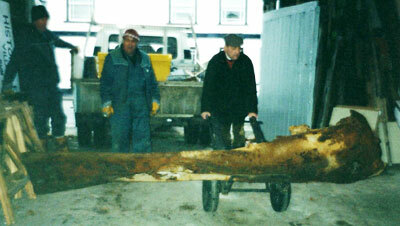 Work was carried out by John Padget in September 2012. We are also grateful to John Parsonson for his help and advice. 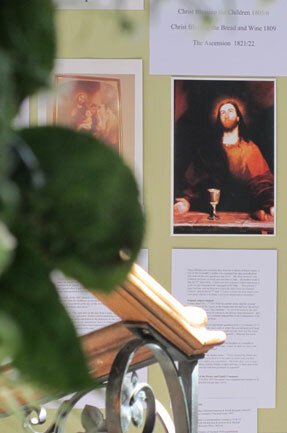 The Society sponsored and created a display to commemorate this important event in the life of the church and the village. 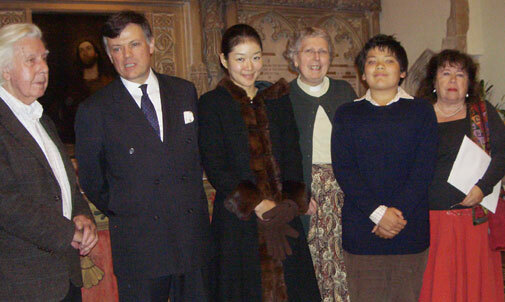 Dr. John Constable, great great great grandson of the artist, and his family attended a special evening event held in church in mid September. A leaflet about the history of the picture and its installation in St. James’ Church was produced and funded by the Society. 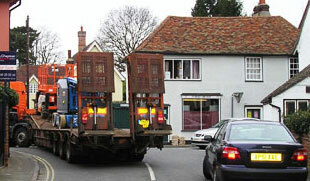 The Society is assisting Suffolk County Council with the monitoring of heavy lorries using short cuts through the village. This is on-going and has resulted in a reduction of short cuts via satnav systems. Nayland received an award for the best new entry. Members of the Society had worked hard with residents and other village organisations towards this and the award reflected the work done in the village for the protection of the AONB. 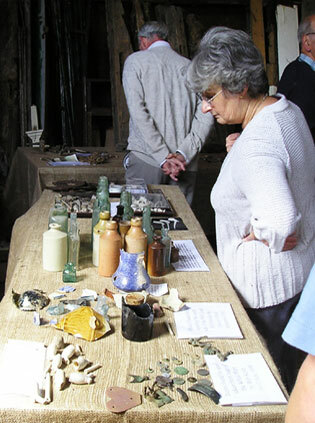 In 2005 a village resident presented the Society with his collection of buttons, cufflinks, decorative fragments and other objects which he had found close to Nayland and Wiston when metal detecting over the previous 25 years. The objects date from 15th to 20th century and include, boot, livery, hunt, military and Georgian buttons, cufflinks and tokens. 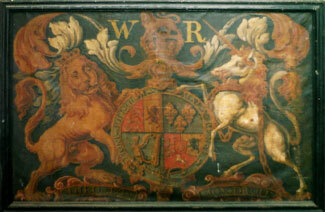 The collection was catalogued with the assistance of Colchester Museum and is displayed in the Church Hall. In 2004 the Society contributed towards the printing of three books chronicling the History of Nayland Schools from 1707 to 2004, including extracts from wartime Log Books 1914-21 and 1939-45 and details of the lives of some of the young men of Nayland and Wissington who served and died during the two World Wars. 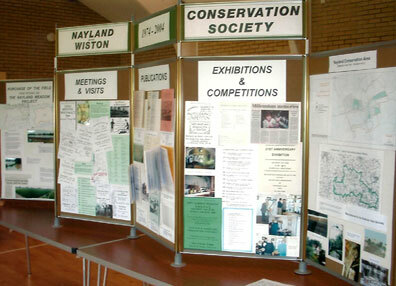 More detail is available on the Nayland and Wiston community website. Order by post from schbooks@fsmail.net (£3 each or 3 for £7.50 excluding postage). From 2002 to 2004 the Society worked with the Parish Council and Suffolk Highways on a review of road signs in the village which culminated in the removal of no waiting plates and priority signs in Mill Street and Bear Street. Donations were made to the church for the security of the Constable Picture (Christ Blessing the Bread and Wine) and towards the provision of window guards, following damage caused by a brick being thrown through the East window. In 2002, at the request of the Parochial Church Council, the Society arranged for the conservation of a piece of the 1953 Coronation Altar frontal in the lady Chapel of St. James’, with the assistance of Maggie Stobo, a textile conservator. This can be seen on the south wall of the Lady Chapel. The Coat of Arms of Wiliam IV (overpainted on George II) was cleaned and relined by Jacqueline Taber of Fingringhoe in February 2004. The work was funded by donations from the Friends of St James, the Nayland with Wissington Conservation Society, the Suffolk Heraldry Society and other friends in the parish at a cost of £3,900. 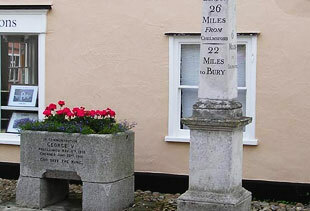 Funding the re-siting of the George V commemorative trough in the High Street so that it and the milestone can be seen to their best advantage. 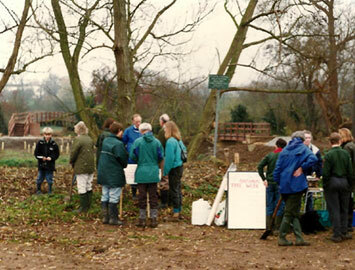 Provision, together with the Community Council, of gates at the Candy lane entrance to Webbs Meadow in 2002. Gates at the Court Street entrance to Court Knoll were installed by the Rowley estate and funded by the Society in 2001. 2000: Remains of a flying bomb (Doodlebug) were dredged from the River Stour by the Environment Agency, the Society arranged for storage until a suitable home could be found. It is now on permanent loan to the Flying Bomb Museum near Southend. In 1999 we arranged and funded the conservation of the Map of Nayland Fenland 1757 which is kept in the Suffolk record Office at Bury St Edmunds. The Society has put on regular exhibitions; notably in 1995 to celebrate our 21st Anniversary and in 2000 to celebrate the Millennium. This included a display of agricultural implements and locally made ironwork and featured screens displaying all aspects of the society’s activities and achievements since its inception. Our 30th anniversary in 2004 was celebrated by an extensive exhibition in the village hall and an extended open gardens weekend. 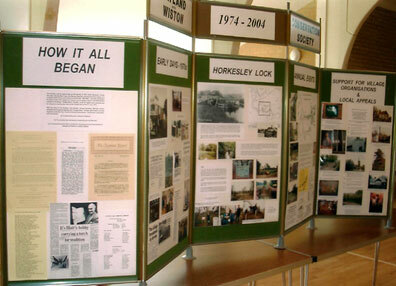 The exhibition featured all aspects of the Society's activities including annual events, planning matters, meetings and visits, publications, exhibitions and competitions, local appeals. 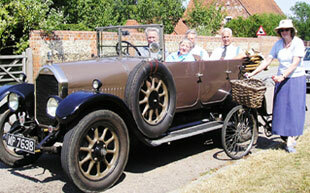 In 2008 a Nayland Bygones exhibition and valuation day was held in conjunction with the Summer Village Festival. 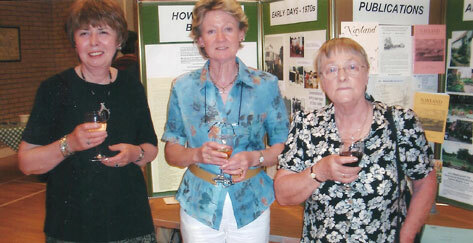 Left & below: 30th Anniversary Exhibition, three founding members of the Society, Wendy Sparrow, Linda Clapham and Joan Moore. Nayland’s first history book was published in 1984 and this was followed in 1991 by Nayland: Suffolk Town and Village, a major project involved research carried out by many volunteers. 1978: The Society paid for and erected the Court Knoll information sign. 2001: We were instrumental in organising an archaeological study of Court Knoll which involved a geophysical survey and extensive field walking by a large group of local volunteers of all ages, under the guidance of June and John Wallace. Approximately 1.5 metric tonnes of ceramic building material was found, including large quantities of Roman tile which indicated that they had been re-used in the construction of a medieval building, which was later demolished. Pottery from the site suggested concentrations of building activity in the 12th-13th centuries and a decline in from the mid 14th century onwards. One of our earliest aims was the restoration of Horkesley Lock Pool, which had become so silted up that there was only a small pool left. The lock cottage had gone and the area around had become overgrown with willow. In spite of a great deal of time and effort, nothing happened – mainly due to the lack of voluntary help needed and the cost involved. However 21 years later the Society’s aim was finally realised. 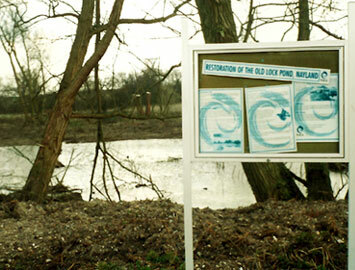 With the help of the Dedham Vale & Stour Valley Project, created in 1982, the National Rivers Authority (later the Environment Agency) agreed to undertake the work at a cost of £70,000. The pool was dredged, two new bridges built and new trees were planted by many enthusiastic residents. It was particularly gratifying that the Society’s early aim was finally realised in its 21st year. 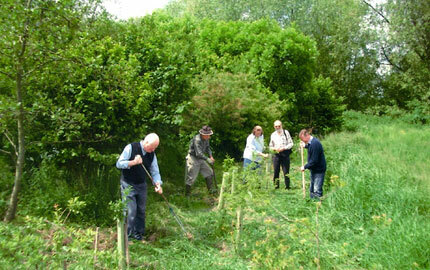 Later, by agreement with the landowner, and under the supervision of the Dedham Vale Project, a small area of trees was planted to the east of the Lock pool and these have been regularly maintained. They are now well established and provide a additional habitat on the riverbank. The area is managed by one of our members.